Nesreen Al-Refai, chief communications officer at WCM-Q, receives the Responsible Leadership Award from Dr. Hassan Rashid Al-Derham, president of Qatar University. Sahtak Awalan’s Khayr Qatarna initiative has received the award for Responsible Leadership at the annual QatarCSR exhibition. QatarCSR is held at Qatar University under the auspices of HE Sheikh Abdullah bin Nasser bin Khalifa Al-Thani, the Prime Minister and Interior Minister of Qatar, and the Responsible Leadership award recognizes the role that Sahtak Awalan and Khayr Qatarna have played in taking responsibility for promoting sustainability and healthy lifestyles among our young people and the wider community. 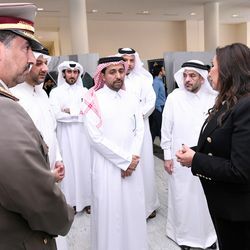 Nesreen Al-Refai discusses the Khayr Qatarna initiative with Dr. Hassan Rashid Al-Derham, president of Qatar University, and other dignitaries. Khayr Qatarna was launched in February 2018 and is the latest initiative from WCM-Q’s Sahtak Awalan – Your Health First campaign. Through Khayr Qatarna, large-scale, climate-controlled greenhouses have been erected at ten schools across Qatar, with the produce grown in them sold to the community with al profits being reinvested in the scheme. The aim is to promote healthy diets and to teach students about sustainability and food security.